Its stature, its material, as well as its 24-hour indication combine to make the new Avenger Hurricane a truly standout model. 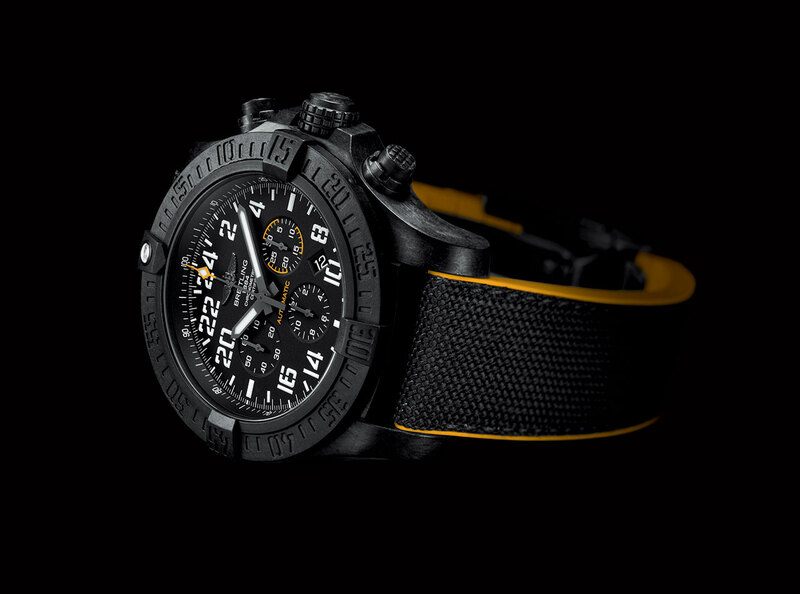 Featuring a 50 mm XXL diameter, a sturdy construction equipped with lateral reinforcements and an all-black technical look enhanced by yellow accents and aviation-inspired stencil-type numerals, it is designed to share every challenge. This instrument for professionals is a compendium of boldness, innovation and performance. 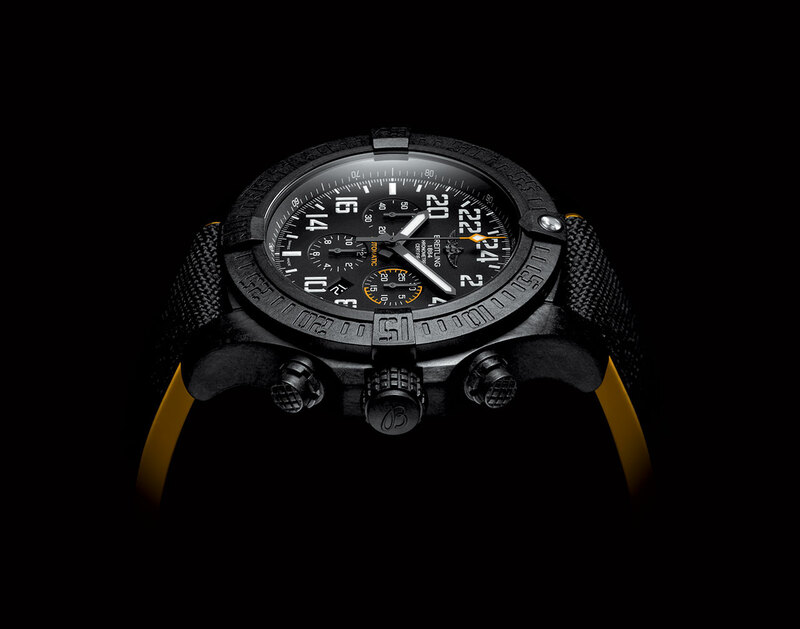 The Avenger Hurricane case is entirely made out of Breitlight®. This high-tech material exclusive to Breitling boasts a number of functional qualities. It is anti-magnetic, stable in respect to thermal variations and above all ultra-resistant to scratches, traction and corrosion. 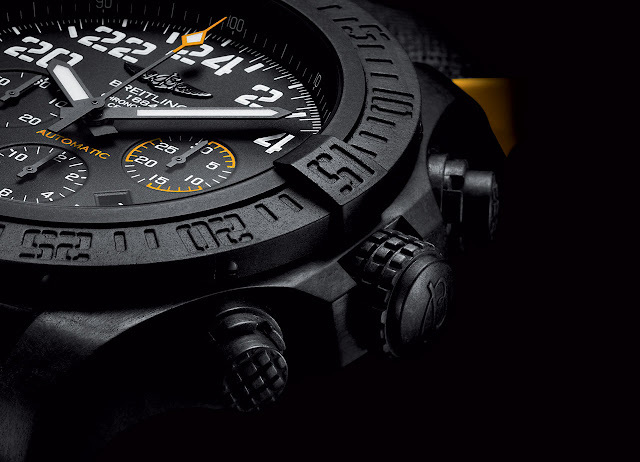 As a crowning touch, it is 3.3 times lighter than titanium and 5.8 times lighter than steel. The Avenger Hurricane is definitely a superlative Breitling in every possible way. 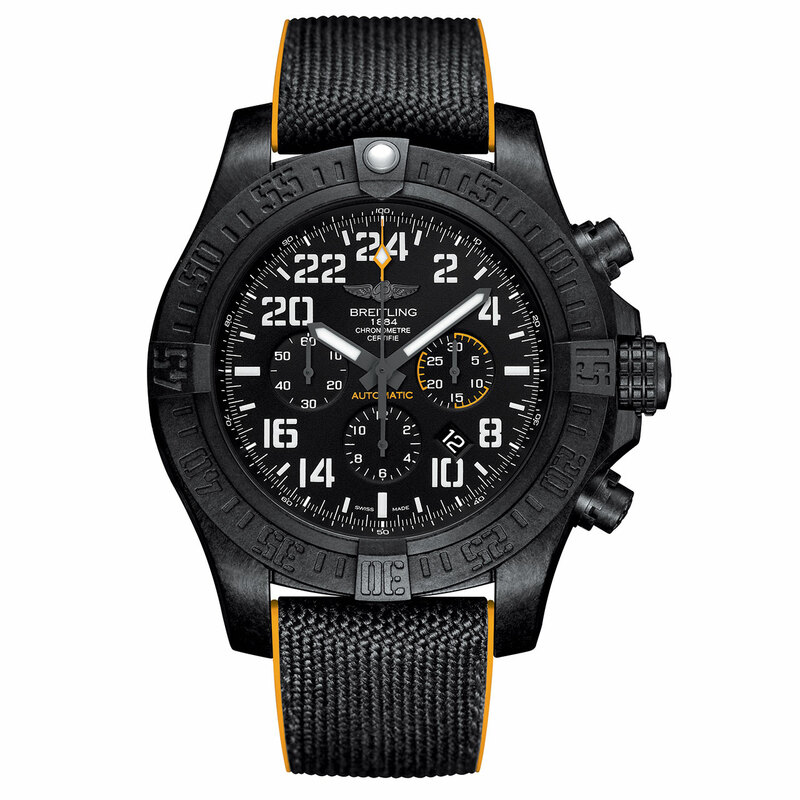 Mechanical automatic, Manufacture Breitling B12 calibre, chronometer-certified by the COSC, 47 jewels, 28,800 vib/h, more than 70-hour power-reserve. Hours displayed in 24-hour mode, minutes, seconds, date, chronograph, 30-minute and 12-hour totalizers. Breitlight®, 50 mm. Cambered sapphire crystal, glareproofed on both sides. Unidirectional ratcheted rotating bezel. Screw-locked crown. Water-resistant to 100 metres (10 bar/330 ft).